For a dependable and convenient way to serve large gatherings at catering events or buffets, look no further than this Choice economy folding chafer kit! With an 8 qt. capacity, this chafer kit allows you to serve your most popular dishes at appropriate temperatures quickly and conveniently. The stainless steel construction makes this chafer durable enough to last in a commercial setting while providing a sleek presentation that will fit right in with restaurant and hotel decors. These chafers are a great price and the quality is very good. We decided to keep them fresh and completely clean but using a disposable tins for food over the existing pan and it held them very well. The entire unit washed off nicely (except where flame was underneath but that is to be expected on a higher flame and is not able to be seen) The unit folds neatly and is easy to stick back in the box it can in for storage. A+++ will be ordering more! I ordered these chafing dishes for an office Thanksgiving dinner we catered. Great product. Easy to dress up or dress down. I especially love the folding frame! No bulk packing. They look good, easy to clean and transport. Also they are at a great price. My only complaint is where the sternos sit it is a little hard to set-up and remove. Going to be ordering more. These chafering dishes are affordable and look incredible. I started my very own catering and i am always asked where i got them from. I will be purchasing a few more for my business. I got to break this out for an event at a school the other day--it did what it was supposed to do, but it is not a commercial grade product by any stretch of the imagination. It is constructed of a very thin gauge steel that will not endure the abuse of everyday use. However, for small events, in home use, or events where servers are used, I am sure they will do fine. You can't beat beat this price, but you get what you pay for. These chaffers are great. It's great that they can fold away to take up less space, while in storage. Do be careful though, they do have some sharp corners. This product is great! Well priced and works really well. I had to use it for a catering job outside in really cold weather and my food still kept hot and up to a hot holding temperature. So glad i bought this and i am planning on buying more! I would recommend this to anybody it was a great buy. Portable convenient and effective! oweThe chaffing dishes worked out perfectly for the event that I had to cater. Using these chaffing dishes made my business and I look very professional. They kept all of the food very hot and fresh tasting. This is an awesome product and I will recommend it. I ordered 2 of these for my husband that caters at times on the side. He loved them. We've been using throw away ones but these look so much better. I. Order. These. Chafers. They. Are. So great. For any occasion. Keeps. Food. Warm my customers. Haven't. Complaint They. Love them so much. They keep. Ordering. We used this for an event this past weekend to keep our cinnamon rolls warm! Outstanding! I love the way it collapses for easy storage and transport and how it came ready to use out of the box. Worth the price and very sturdy. Great quality and fast shipping. These are a great addition for business and personal use. Much nicer than the foil pans I normally use. Also more cost efficient than throwing away money on foiled pans. Great product! would order again, made from good quality product you can count on. If you want to travel this is the one to get! This is one of the best item I have purchased for my personal entertaining. It has great value and looks much better than theses disposable ones. Highly recommended! I ordered a set of these because I had read other reviews praising their quality, and at the price they're listed for they beat out anything from other retailers. They arrived quickly, and were of great quality. These are so compact yet so sturdy! I can't believe I didn't buy these sooner! They are a great deal & do a wonderful job keeping your food hot! we use this chafer for our party. we love this product so much. we definitely will buy some more again . also love the price too. LOVE THESE!! We ordered 8 for our caterings and they have not disappointed. They look nice when set up and are easy to wipe down. They also stack fairly well except the lids. I loved this product so much i recommended it to a fellow colleague/caterer. It shipped fast and was shipped secure. The price is affordable and the product is very durable . These are quality chafing dishes. Plus with the folding frame they are easy to transport. We have used the ones we purchased a few years ago and they are still sturdy and work great for catering! I bought this one for my catering purpose and it worked fabulously. Quality is very nice , keeps food fresh and warm evenly . Gonna buy more ?? These folding chafers are perfect for our needs because they are so easily transportable. Sometimes the tines on the stabilizers get bent, but they are easy to bend back if you are careful. These chaffing dishes are good for small house party. They are strudy enough to hold and carry heavy food. Easy to store. Although edges of the the water trays little sharp but if you handle it carefully, it's not a big deal. I think it's a good investment for those who like to entertain many guests. This chafer is superb, it pass my expectations it kept the food hot the whole time at my daughter in law baby shower. I will definitely buy another one. I highly recommend this chafer. I ordered several of these for an upcoming event. They look great! However, I don’t think they will hold up for long. It’s very thin. I would’ve appreciated some instructions with this. Great for its price. Base can be a little sharp when folded so be careful. We use these for events on site, and they are easy to prep, and then put away. Would buy again! This is a great buy! They assembles and brakes down with with speed and ease, it makes catering much easier for us. I have purchased 5 & plan to order more! These work very well for catering and because of the collapsable frame store very nicely. The only danger is in if you aren't careful, the piece that keeps the main support from collapsing can be missed and make it unstable. You just have to be sure it is properly in place, and also be careful if you have to reposition it on a table. best chafer set i have bought thus far. love the fact that the base folds. saves alot of space when it comes to storing. Its super easy to assemble and break down. Would definitely recommend, plus the price is great and they deliver very quickly especial if you have a plus account. If you want something cheap and basic this is it. We've used them 3x as a rental company and there hard to keep clean. I'll be investing in some roll tops. The nice part is, I have the base as the roll tops don't come with a base. In reality, chaffers make an event. If your trying to enhance your facility or rental company invest in the nicer ones. These are good to get the job done or be used in the back of kitchen for warming. Thank you for your feedback! We’re sorry this did not work out for what you need it for! For recommendations, please contact our Customer Solutions team. Love these Chafers they are easy to clean, light weight and the covers are easy to handle. I ended up ordering 6 more and i've had them for 3 years. I used these chafers for my wedding and they worked perfectly! After you use them they do have markings from the chafing fuel, but they kept all our pasta warm for the evening and even though they're economy, they work just as well as the nice ones in my opinion. We purchased this item because we were looking for something with quality that does not break the bank. great quality and does the trick! Awesome! Perfect! It is a very good quality product. For the price, I expected something less good quality! But I was wrong, the quality of these trays is very high! excellent chafer, we use it for all our parties and despite its low cost its appearance is great. I bought extra serving pans in different sizes so i can adjust based on what's being served. This item me and my event stand out even more. They came in handy and they are very easy to transport thanks a lot ?? Love love love these! Very easy to transport since they are foldable and made out of quality materials. We used these for over 2 years before needing to purchase more. Would definitely purchase again! Order these for a birthday party and they worked perfectly. The price is great, and the chafers performed the task. I was going to buy the more expensive chafers, but these worked just as well. Love how easy it is to transport and how professional it looks when you have an event. I can't wait to use it during Thanksgiving. Easy to wash and easy to store to away. This chafing dishes are a good bang for your buck. Simple and inexpensive but still get the job done. They don't take that much room which was the biggest deal breaker from the ones that do not fold. Too light weight... It runs for awhile. the material seems a little thinner than some others I have, we used this for awhile we had and it was okay. We appreciate your feedback! We’re sorry this didn't work out for you. If you are looking for a new chafer, please feel free to reach out to our Customer Solutions team for assistance. This chafer is a great product buy it over a year. It is still in good condition after several uses. Customers have been satisfied every time. These products are very good and i love them,and price is very affordable,,that's why I recommend to everyone to purchase this product,,thank you so much that I found this website. Great product nice enough for formal event and easy to clean. This product is durable and we have paid for it over and over with renting it for events. I got that chafer for an event with family and friends for a get together time. I purchased a total of 4 and I am very happy because they are very good. I reuse them again and again. These chafing dishes have worked very well for our events, and are easy to set up. They definitely are not fancy, but they are a good value for the price. Product holds up real good and it does not rust.I can even use the deep pan or not so deep pan for any occasion..looks professionally done at a backyard gathering. I bought these chafers because of all that they include. The box did really contain the stand, the water pan, insert pan and lid. it also included fuel covers. They look professional and will be ordering more for an event. chafer dish i bought over four these guys love them. it comes so handy for my catering jobs. i would again once it gets lost, stolen, when it time buy new one. These are great, love that they fold. Great for keeping a pan of Mac and Cheese warm; when we are serving lots of it these keep the prep time down. Durable chafing dishes, made with quality materials. I really like the folding feature as it takes up less room when catering and they are super easy to set up. I ordered these for our catering business and they are exactly what I needed. They are sturdy, easy to care for and look great on my serving tables. The Choice economy 8 quart stainless steel chafer is a great buy and is perfect for keeping our side dishes warm at our events. Easy to transport and store with the folding frame feature. A great price and the quality is superb. I wanted a reasonable option for keeping food hot when I had larger gatherings. These chafers did the trick and kept our Thanksgiving fare nice and hot! This chafing set is great! Its classy looking while still being sturdy and reliable. I would recommend this to any catering business and even home entertainers. I have had the Full Size Chafing dishes without the folding frames for years and love them. Whats great about this one is that it saves more than 50% of space during transport with these folding frames. They still maintain the durability as well. This product is amazing. The price was amazing. Everything stayed hot and everyone was pleased. I will be ordering more of these chargers for my business. The folding aspect of the chafing dishes make them very convenient and easy to use. They don't take up a lot of space when not in use, but are very stable when set up. Great dishes for caterings. They look professional and easy to set up! Also super easy to clean, the pieces all fit in commercial dishwashers. They looked brand new for months, now we have used them a lot but they still look very good. These aren't the fanciest chafers I've used, but they're more than adequate for the catering jobs I've put them through. They feel a little flimsy -- again, I'm comparing them to the more expensive models -- but they have held up nicely and look just fine on the table. Two canisters of fuel (which you have to buy separately) do a fine job of keeping everything hot. Great product, easy to use and very elegant presentation. Will certainly purchase again. Durable, practical and good presentation. I highly recommend this product to anyone. I've purchase 4 of these food warmers and use it for all types of events! Easy to clean and simple to set up. Everything is dishwasher safe. I save the box that comes in and once it's dry and put it back in there for storage. They worked great! Very easy to set up and kept food nice and warm. They were easy to clean and break down for storage as well. Would highly recommend! We ordered two of these stainless steel chafer with folding frames for use at our catering events. They work great and the price cannot be beat. We got tired of using the wire racks and wrapping them with foil. We saw these on webstaurant and realize this was a great price for the 5 we purchase. These are great for keeping the food hot and makes you look professional for any job. Very nice chafing dish used at a graduation party and worked very well. Seemed durable, but have only used once. Folds easily and fits back into box nicely for storage. Excellent value at this price point! For the price of these chafing dishes, they were amazing. We were having a small gathering and these kept our food warm through out the night. We lined the dishes with disposable ones just to make for easier cleanup. Worked great! This product meets the need of both in home party and catering. I have four of this chafer and plan to get more since the price matches my budget. These work great, easy to clean and keeps the food hot! We’ve used them over 100 times and they still work the same. I would recommend them to anyone catering. We used our chafers for our first ever wedding event. These are great for the price. They do hold perfectly and kept our food at the temp we needed it to be. I have a few of these and they are perfect for my little get togethers. It's a great size and keeps my food warm. I get compliments on these and work very well. I purchased 8 of these for my son's birthday party. It keeps the food warm. I like that it is stackable and it's is easy to assemble and stored away after using it. This is a great product. I am a caterer and all my clients love when I use the items. They are elegant, they look real and most importantly they get the job done. I would definitely recommend this product for anyone, anywhere and anytime. Wonderful product for weddings or any other special occasion. I like the size the finish of the stainless steel the great construction of the folding frame, really great quality product and an excellent price!!! Works perfectly - very sturdy and super easy to set up!! We use these a few times a month for a buffet - never had any issues with them - I'd order again! These stainless steel chafers are great for your typical buffet style dinners or brunches. They store in a compact box which makes it easy to store after use. The stainless steel look give them a very fancy look and the lid holder is a plus to reduce messes. Great product. Definitely recommended. This is a great basic chaffer. It works to keep food hot, it folds easily and stores compactly. It is not the most beautiful chaffer ever but it gets the job done. These Choice Economy 8qt Full size stainless chafer with folding frames are awesome. They heat up food very quickly. Easy to cleanup and setup. i will definitely purchase again really soon. Not to mention delivery was very fast. I just received my 4 chafers yesterday in the mail. I have done a lot of research and this is the best deal by far! Love the folding feature. They are more sturdy that I expected and the metal is very durable. I can’t wait to start using these and will probably be ordering more soon!! Unbelievably convenient and incredibly easy to fold, store, set up, and transport. More importantly, however, is that these chafers are very sturdy and durable. I love that there are clips to hold the lid up. I would definitely recommend these. These are awesome for the cost! Great overall product and are exactly as shown. Classy yet not too costly! Shipping was great, no damage! recommended! We ordered 5 of the 8 qt. stainless steel Chafers for our church fellowship events. They have been very useful, since we currently don't have a kitchen. The material is very sturdy, yet portable. We love the idea that you can take them everywhere you go and at the same time keep your food warm for a long period of time. We are enjoying these Chafers and are very happy with our purchase. Thank You! Beautiful addition to the day! These Chafers are gorgeous, easy to clean and super convenient. I ordered 4 and intend to order more. Serving perfection! The fact that these fold make my life easier. They look professional and are easy to travel with, which is essential in a catering business. I love them. I bought 6 Stainless Steel Chafer for a 25 Wedding Anniversary. Everyone ask me where did I rent those from, they are beautiful. I told them I bought them and they were actually cheaper to buy than to rent. I highly recommend these Chafer to anyone. I've done 3 wedding and several personal parties ranging in size from 50 up to 250. I purchased these cause the budget was tight and these fit the bill. Couldn't be happier. They provide a professional appearance at a very reasonable price point. The folding frames make for easy storage in storage totes. Highly recommend this product and I'll be adding to my line-up shortly!!! These were great! Quality is what you would expect however the price is really where this product stands out. I did a lot of research and this is by far the cheapest price I have found on chafer dishes. I plan on buying more. Fast shipping & the folding frame is perfect for all our off-site events. Highly recommend this product to anyone needing an easy to travel solution for their chafer needs. this is one of the best item to use for party and I will order more soon and I will tell all friend where to find these items from very good item for me. We use it for catering, and just family parties. Is big enough. The lid makes it even perfect to protect the food. I am very happy with my purchase. These chafing dishes were a lifesaver for a last minute catering gig I was asked to do! Very easy to manage & nice looking. Thanks webstaraunt! I received my chaffing pans a couple of days ago. I love them! Great quality. The foldable stand is great makes it easy to store and the handles are great too. It doesn't get hot so that you can pick up the lid with out using hotpads. Will recommend product to my coworkers and friends. Priced these Chafer on other websites and in stores, Webstaruantstore's prices were the best and the product was amazing. You get your moneys worth form these and they look nice too. Wow!! I love this so much. We had a gathering for my anniversary to keep are rice warm , it started to dry up a little but I put some water in my rice and stirred it up before you know it everyone is here and it was perfect. Lighter weight than I expected. Still does the job needed. Cleans up easily as stores nicely. I recommended for people who have restaurant, because this come with great price and useful. this stainless steel chafer is pretty useful for big parties like buffet styles at our restaurant!! its a good item to have for big restaurant parties thanks!! The Choice Economy 8 Qt. Full Size Stainless Steel Chafer with the Folding Frame has been a huge lifesavor. Ive been dabbling in the catering business for some time now, and i finally decided to do my own thing. Well, ive been using the regular aluminium pans for food, however, the cleanup, transfereing and storeing is not at alllll ideal. Espectially being outside. Its not as appealing to the eye. And lets not even talk about the flys.... This Chafer is large enough for most dishes, portable, and super convienant. I absolutley love it. Its great to look at and it'll save money in the long run because they can be used over and over and over again. I highly recommend these to anyone who has a catering business, or even a family that hosts more than one gathering a year! These chafing dishes were a great addition to my business. I am expanding and needed a few of these chafers to get me started. They arrived on time and undamaged. I will be ordering additional supplies. The pricing was also a plus. Love how easy it is to put together. Will definitely order more in the future. Great product. Deep pans and like that it came with fuel. These chafers are great for light duty occasional use. Compact, and easily foldable, but will not hold up to commercial/catering use for more than a few jobs. Residential/occasional use is suggested. This is a great chafer for the price. I love the way it folds up. Makes it a breeze to put away and store. Good value. These came in very handy. I bought two. They are economical and I love that they collapse. Definitely take up less room then the other chafing dish on the site however it is not mirrored which is a little bit disappointing. Overall not bad for first use. Will have to see how they hold up. Very pleased with this product, looks great, sturdy, and its a great size! Comes with everything you see in the description. I would recommend this product to all new business owners in the industry! This item is very nice and parfet for my needs the price is also good. I buy 6 and I am planning to buy more. Exceptional product well worth the cost. We bought 3 and it makes our catering jobs look so much more professional and they are easy to use. This product is basically identical to big box store chafers with one exception. The price is at least 30% lower. I hate having to replace equipment but at this price its not quite as painful. Great value for the price. Easy to use and all the folding mechanism seems to hold up well, easy storage. Ordered a few for a customers and all have been happy. Some edges are sharp, just need to be careful or file down. Pretty good option for smaller parties. I personally do not like using these for bigger banquets. I prefer the roll top ones, but these are really nice for the price. ordered three of these for a cookout and every one loved how professional they looked. fed a lot of people. great product. comes with everything you need to keep food war safely. It's a great product. Keeps food descent when table was set. I love it and it was delivered on time. Will buy from this company again. We ordered three for the holidays and everyone was quite impressed! The lid holders were wonderful and came in handy if you have limited space. They are a high quality product at an affordable price! this is as sturdy or even sturdier than the basic rigid chafing dishes that ive used. it's made well and folds up easily for storage. Great economy chaffing dish that folds up to store better. Would be nice if all the parts interlocked for storage to keep everything together, but overall these are a well well built economy set. Never had to replace one, just had to buy more to keep up with growth. These look as pictured and I’m able to stack 4 nesting the parts in a white plastic tub. They fold compactly and have held up well. Great price, not gorgeous. This is the best chafer for the party ir event. We used for our private party couple weeks ago and it worked very well. Nice looking and very sturdy. I will buy it again. The Choice 8 Qt economy chafer was a perfect fit and size for our occasion. Not only a great price, but also super easy to get together. These chafing dishes were exactly what I needed to help start catering places!! They were affordable and great quality! I recommend them, great value and great product! We purchased the Choice Economy 8 Qt. Full Size Stainless Steel Chafer with Folding Frame because of the easy storage. We have not been disappointed, good quality for the price. We will be adding more to our stock. These chafing dishes is real nice I bought some others from a different company for more money but these are so elegant can’t wait to use for my events over the holidays and in the future. Excellent buy the chaffers are a good quality well worth the price. I purchased 3 at first and reordered 5. I would definitely recommend this product. these are great products, huge and perfect for big events like weddings. I’m going to purchase another set. Worth the price and great find indeed! It's hard to beat the value on these chafing dishes with everything included. Just the water pan and food pan can cost as much as the entire set. I will be buying more. I love these choice brand chaffers. We use them for our pop up events and even though they are much less expensive than others they still have a very professional look. Ordered 5 of these for our daughters wedding reception. Was very pleased with these chafers. Fast ordering and fast shipping. Love how the frame folds for easy storage. Would definitely recommend this product. Ordered 6 of these and they provide such a clean and professional look. Very easy to set up and transport. The functionality, appearance, and price make these a 5 star product hands down. I LOVE these chafers!!! I use them with the Choice Replacement Lids because those are much prettier. The folding feature takes up much less room when transporting. I sold all my old chafers and bought these instead. Will be adding more to my collection soon. Very nice! I glad I was able to purchase these at a fair price. Definitely would get a lot of uses from them. Great buy! These warmers do the job I can't say they are the nicest warmers, look wise, they are more basic. I'm considering upgrading to a different design for my more formal events. They are pristine, very sturdy and look professional. Would definitely recommend to all my clients. I find that they are easy to clean whenever i use it as well. Do remember to clean it and don't leave stains on. These chafers are a great alternative to renting or disposables! The folding frame makes for easy storage, but when put together it looks very nice for a good price. I gotta say, I'm really happy with this purchase. I originally ordered 6, and after using them at several events, I just ordered 6 more. I usually wash them up at the event and do a final wash when I get them home before storing. I saw a few complaints about the staining from the sterno. I noticed it as well, but I use Purple Power cleaner and it come right off. They are not as thick as some of the higher end products, but you will not be disappointed with this purchase, especially for this price. We are in love with these chafers. We ordered 4 at one time. They are easy to clean with only a good wipe down. No need for scrubbing or soaking. Easy to assemble no need for help. I ordered 5 of these for a wedding I was catering this past Spring. They were easy to assemble and very durable. I absolutely love them. I will definitely be ordering some more in the near future. These are great for catering and very professional looking. They are perfect for our business and the folding frame is a plus. Great price and product. This is a great value item! It keeps your food hot and clean up is easy. Set up is easy and It folds down for easy storage. Great set, the price is fabulous and I love that it folds down for storage. Plan on using disposable pans or higher quality food pans for longevity. This was the perfect choice for my catering start up. Chafer was easy to set up and travel with the folding frame was the reason why I purchased this chafer. I have used these for many different events and they are wonderful. I have received many comments from guests on how professional they look so I highly recommend to everyone! These were great quality. Used them for many events. Will be ordering soon. As well as other products for my new catering company. I use this site for all catering supplies. I really want to like this product, however it easily collapses under little to no pressure at all. It's too bad too, because--again--I really want to like this product. We have over 40 chafing units so it would be handy. We appreciate your review, Michael! We are sorry this chafer did not meet your expectations. If you are looking for a chafer that would better meet your needs, please contact our Customer Solutions team for a recommendation. I am satisfied and very happy with my order. I ordered these to use gor my birthday party. They will aldo be used for my Thanksgiving and Christmas gatherings that I will hsve with my family. I bought this along with 1/2 pan inserts to use for hot dips at an outdoor event. It came in perfect condition and folds up to a good size for storing between uses. for the price, this chafer is plenty sturdy and although i have only used it once, it seems to be of good quality and will hold up for a long time! These chafers are I think one of the best bangs for your buck. They are simple and very easy to use. They even stack into each other for easy storage. Highly reccomend. Choice Economy 8 Qt. Full Size Stainless Steel Chafer with Folding Frame Good quality! No problems storing this product. I will purchase this product again. These chafers are great. Easy to set up and clean up. Very sturdy and work nicely for weddings and other party events. Would def. buy again. I purchased two of these chafing dishes for an event I catered and they were fantastic! I love how the lid has a resting place when lifted and the convenience of the stand folding flat and everything else nestling inside each other when not in use makes it really easy to store. I'm very pleased with my purchase! This chaffing dish is just beautiful, it adds beauty and elegance to the table. It looks professional and classy when ever i used it. The price is also good. The best price I found for these basic chafers. They are exactly what you expect. We use them whenever we have banquet buffets and parties. Recommended! I ordered these chafer for my daughter birthday party. They are very great deal and very reasonable priced. would order again. I love this company. I was so surprised with the quality of the chafers I order. The size is just right and price reasonably. Will order again. Very Pleased. These chafers were great. The only downside was it was a little tough to get the flat plate meant to hold the chafing fuel locked in. Other than that they worked great and looked good. I love the folding frame, it made it a lot easier to store. This chafer is perfect for holiday parties. The unit is more industrial than ornate, but for the price you really can't complain. I read some reviews stating the edges were so sharp they will cut you. That isn't the case for my delivery. However, sandpaper would fix that. The stainless steel is sturdy enough, but thin enough to reduce the weight of the unit. The base is solid when put together. The burner plate has cut outs the attach to the foldable frame eliminating any movement. great value, great size, i love it! Love the two Sterno holders! They have handles and sliding lids to put out the flame. Caution: ensure the sterno holder cover plate is completely out of the flame, because it will heat the handle and possibly burn the bare hand. I ordered these 3 chafers to cater for my niece's graduation party. They worked out great !. Teenagers can be rough with your cookware but these chafers were sturdy and looked great. Overall I really like this! It looks nice, folds down, assembled in 30 seconds, and the top can hang two different ways. I'll be using this for my wedding as it was only $2 more to buy this versus renting from another company! A great deal...they are not a top of the line item but they are solid and well worth the money. The folding frame makes storage easy and compact. I bought these for an upscale event I was doing and these were absolutely perfect. They are very durable and keep food much warmer than the wire rack versions. Transportation is also great with these. They fold down for easy transportation and I followed the tips of many in lining them with foil pans to help keep them clean. This 8 qt. steel chafer is great and is what we expected. It is large enough to hold big, buffet food items and is very durable. I am completely satisfied with this product. Buying these Chafing was the best investment I made this year. Easy to assemble and the clean-up was just as fast. I will recommended to buy . We use these chafers in our catering business and love them! The fact that they fold up is so convenient. It makes them easy to pack and transport and takes up little space. They are good quality too. The tray for the fuel is at a great height and keep food hot. It will even boil water! We loved that they came as a package, everything you need (less fuel) in one box. We simply take the box to each event and know we have all the items we need. I will purchase more as business warrants and would highly recommend them! These chaffers are durable and we have had ours for a while now. They stack well for easy storage and makes them very portable. These are not the polishable kind so know that when you buy, they do attract fingerprints. Overall great product! This is an incredible chaffing piece. Not only does it hold full and half pans, but it collapses and stacks very easily. Perfect for catering needs. I bought 6 of these buffet dishes and honestly i couldn't find anything better than these anywhere. They were exactly how I expected them to be. I used them already and they look so elegant. They are a large size and have enough room in between for water for the steam. Im highly satisfied with my dishes. These are awesome for a young catering business, they store quickly and easily in the boxes the come in and take up very little room in my car. They are actually quite strong and hold up well! This is a great first set of Chafers. Just remember to add hot water to the bottom pan before lighting the fuel! I purchased 5 Chafers for a family event. Very happy with the purchase. The chafers are well made and made for easy storage. They are definitely worth the money. I usually purchase the disposable chafer and have spent more that the price of this item at this website. I decided to invest in these chafers for my wedding. Since my wedding has passed, I have decided to use them for catering events. They look professional and simple. I love that these chafers have a rubber handle so that they won't be too hot to touch. The Choice Economy 8 Qt. Full Size Stainless Steel Chafer with folding frame was a big hit all the guest really like the nice look! Did the job well, a little difficult to put together but over all I am pleased with the result. Would order again and will soon! These chafing dishes are good for extra things and they fit in well along with the fancy dishes that i have already have i plan on getting more of these great buy. Love, Love, Love these full size chafing trays. They are great for catering, and or family gatherings. I love how is folds to save space when loading in and out the car. Great price as well. I received my steel chafer and they are very well made. They are just like what is in the picture. was deliver right on time . Very happy with them . We have had these for about 6 months and have used them for numerous receptions. They have held up very well. I like how they fold up for easy storage. We simply fold up the bases and hang them on a hook on the wall and stack the trays on a shelf. They are study and assemble quickly. I use this chafing dish for the holidays when we have a lot of parties the price is excellent and does the same job as the expensive ones. Ordered for my catering business im starting very sturdy and durable will definitely purchase again thank you.. I love this website it has everything you need. I purchased 3 of these chafers. I had no experience ever using anything like this, but needed an easy, affordable, and convenient way to feed around 130 people at least once a month. These chafers were much better than I had expected. The quality is great. They are very easy to set up and use. They work just as described. They stayed hot for hours after I turned the flames off when I first tested these out. I would definitely recommend these! These chaffing dishes are affordable and look incredible. There nice that they can be folded up and stored using less space I will be purchasing a few more for my business. I love this chafer! The price is great, it keeps the food warm, and they can fold away to take up less storage space while in storage. Just be careful with the sharp corners. I will buy it again in the future and definitely recommend it. These Chafers with the folding frames are literally the best things since slice bread. I am still amazed at how a product so lightweight can be so sturdy once assembled properly. They make setting up and packing up a breeze. I love using them and will most definitely be ordering more. These are easy to set up and clean. The bottom pan does burn easy, once its burned it doesn't come off but they are very professional looking. Great buy for the price. These are very nice, and I will use them in my daughters wedding. The event will be held later, so I will not have any videos until then. I would recommend. Great for the use with our stations. We are able to put 2 in a module at a time , light weight but heavy duty. I recently purchased these chafing dishes for our catering business. They weren't very expensive, but look very nice and work well. I would definitely recommend these chafers! these are a great cheaper alternative to expensive chafing dishes. Perfect for a bbq, or small family gathering. They also fold up nice to be accommodating to small storage spaces. These are great for the money, Not too fancy, but do the job they are intended to do. The best part is that it folds up small for storage. I put it right back into the box for safe keeping. This item is Great So glade that I ordered 3. The item add so much beauty and class to any event. Very easy to clean. I love these items. These chafing dishes came so quickly with ample time to prepare for my event. They are awesome and clean easily because of the nonstick pans. I'm so glad I discovered Webstaurant! The Chafer with Folding Frame is just what I needed for catering for large groups. Great pricing too! I may be ordering another! I love this product I ordered 7 already and I'm about to order 4 more I use them at all my events large or small because, they make the event look so much better with great equipment on the tables. I'm a small business owner and the pricing of these chafers was great for what I got. They are easy to clean and store. Everything you need is in each box. I'm a caterer and looks generate customer's will continue to purchase these chafers because of the quality of the produce. I absolutely love these!! And so does everyone who borrows them from me. I will be purchasing more of these, since my request to do more buffets have increased. Omg i love these buffet trays for hosting parties such a good deal. First i bought 5 and i had to buy 5 more. I highly recommend this product ?????????? Chafers are convenient and easy to assemble. They are light weight yet sturdy enough to hold a full pan of baked macaroni and cheese . I highly recommend if your looking for an inexpensive chafer. Great price. Like the compact frame as chafers take a lot of space up! Used this for an offsite catering and it worked very well. Gteat folding frame makes these easy to store. 4 or 5" height when folded up. I love this sleek design. Value product for any event. These are exactly what we needed, quality and looks. Shipped the same day and were delivered 2 days later. Pushed our catering business the next level and these were perfect. This Chafer is great and was a great deal! It is solid, keeps food warm and has been a perfect for our samples table at local events. Good product. I love that the legs fold because it makes it easy to transport and put in storage. They are not super heavy like most of the commercial style chafing dishes but they are decent quality. These chafing dishes worked great for our wedding! They distributed heat evenly and were easy to clean. The folding frame makes it convenient for storing as well. The chafers looked exactly as expected when they arrived. I have several family events planned soon and I am sure that I will impress everyone with my chafers. We were hosting a 3 acre party for a builder at his new development, Granada Park in Sarasota, FL. After looking at used rental chafers we decided they did not portray the luxury image we are known for so we bought 4. Needless to say we hosted a cookout for over 100 people and these chafers did the job and then some. Much nicer than rentals and certainly much nicer than the disposables. Needless to say the builder sold his model and is building a new one. We'll be back with these chafers to do it again! Also like how they are so compact for storage. Really nice 8 qt full size stainless chafer. I was surprised how nice it was based on the great price we received. Im sure this will last us a long time. The Choice Economy Chafing set was exactly what I needed. I plan to use it primarily for parties when I want to keep a good amount of food warm. I purchased four and used all of them during Thanksgiving Dinner when I had 20 people over. Everyone thought it was a great way to serve the food. Definitely suggest them. Used chafer for Thanksgiving as a trial for business use. Chafer performed absolutely as I had expecteg, outstanding! Chafers not only added to the display it was assembled very quick and disassembled just as quick. Recommended for both professional and personal use. I was trying to find the perfect thing to serve my food at my wedding in. These are amazing. I love the fold down design, it allows me to store them without taking up so much room for the frames. I purchased three of them and could not be happier ! We are catering our own wedding to save money where we can and were looking for a nice chafer set. We bought a few but plan to order more. These were a great price for something we can use again and again. Much nicer than the cheap aluminum or disposable sets. The stainless steel looks great and very professional. The set also folds up nicely for storage which wonderful. THANK YOU SO MUCH!! My oldest daughter and I often host Thanksgiving and Christmas for our family and decided that it was time to secure the equipment that would allow us to effectively do this. We have not used them yet, but will tomorrow for Thanksgiving. The main thing that I like is that along with the quality product, the responsiveness of customer service staff is AMAZING!!!. We ordered the items last week and when I asked if they could assure the items were received by tomorrow, Thanksgiving they got right on it and they arrived in time for us to use them! I am now thinking of all the other items we need to assure our future family dinners are the best they can be! THESE FULL SIZE STEEL CHAFERS WERE DURABLE AND KEPT THE FOOD HOT. THE LID WAS TIGHTLY ON THE CHAFER TO ENSURE THAT MY FOOD WAS STAYING HOT. Really affordable and easy assembly. Great if you don't use them much for the price. We will probably only use them twice a year if that. Very happy with my purchase. Super fast shipping and product received exactly as described. I'm sure these will last me a long time, but will definitely order from here again if I need to. Just what we needed for a community-based fund raiser to support our center. Always had to beg and borrow now we don't have to. Only small negative was they don't fit in steam table. The folding standard a real PLUS! These chafers are wonderful. We are catering a wedding for a friend on Saturday. We were going to rent chafers but when I found these for only slightly more, including shipping, I decided to purchase them. So glad I did. I wasn't sure I would get them on time, but Webstaurant Store was wonderful. They shipped them the next day (I was late getting the order in on Monday afternoon) on Tuesday and they arrived on Wednesday. I could not be more happy with the product or the customer service. So glad I found them on the internet. You may think shipping is high, but if you calculate it in the price, it still comes out much cheaper than other websites that offers free shipping. Thank you WebstaurantStore! I ordered other items on Tuesday and they will be arriving today (Thursday). These chafing dishes are alright.. They are basic and get the job done. Be careful, the edges are sharp (I cut myself). Good price, okay product. I purchase most of my product from Webstaraunt. They carry the best quality products than any store. My favorite place to stop and shop, Thanks. Wow! Super convenient, and good quality. I will certainly be purchasing more of these as time goes on. The reasonable price and the storage size combined with great quality makes it a perfect fit. Folding chafers easy to carry and store away. Caught them on sale so I was even more pleased that I had purchased them. Great quality. By far the best chafing dish set up for the price. I owned several that I bought from a big box store and these out preformed those hands down. They are very sturdy and have held up to BBQ competitions very well. Going to be buying a few more. Received my order of 5 Steel Chafers I just love them. I do alot of catering to my football, basketball teams, and Daycare. I was so impressed I placed another order of five today. I like all my cooking equipment to look the same. I will be sending photos and video soon. These chafing sets are what you would call a BANG for your buck! Excellent quality and look for an even better price. For any person involved in catering or even if you have an event at home, this would be an excellent buy! I purchased 8 of these chafers specifically for casual and outdoor events as I find chafers more suitable than disposable foil pans with aluminum foil and/or plastic covers on top that can easily rip. This chafer is very easy to transport because the legs fold, easy to set up and take down, and easy to clean. Not only are these chafers very affordable, they are absolutely perfect and will add a professional look to your event. I currently have six (6) of these chafer warmers. They are a very good buy/purchase for the price. I have used them on multiple occasion and events. They kept the food nice and hot. Once stored, they take up very little space. These choice economy full size stainless chafers are great. They serve there purpose well and are well built and are a great price, lowest I have seen. This chafer is easy to set up and easy to store. Sturdy, well-priced and very efficient. We like our chafers very much. Would highly recommended! We have ordered a dozen of these chafing dishes over the last few years, and they hold up well. A very good product for the price. I was so pleasantly surprised how great the quality of these chafers is. They worked so well with ice water to keep food cold outdoors for hours. We haven't used them very much with heat to know how long it will keep the food warm, but very pleased with the cooling. Another item that arrived sooner than anticipated. Nice! Now, on to this item,.. I was rather hesitant to purchase this item anywhere. Believe me, I shopped around quite a bit. Why I did not look to The Webstaurantstore first? I have no excuse. Not only did I purchase 4 Chafers, it cost a lot less than the competitor! Excellent job, guys! ordered a few off these for my business start up, GREAT product, durable , easy to clean, and I really like the folding compact design to save space when not in use.. OUTSTANDING PRODUCT IF YOURE ON A BUDGET !!!!!!!!!!! I love this product. i bought it for a 70th birthday party. The fact that it is fold-able makes storage easier. it's shinning stainless steel appearance added a touch of elegant and I will definitely buy more. Love the new chafing pans they are just what I expected. Shiny easy to clean wipe off fingerprints. I love the new fold up stand easy to store. Take up little space. I will b using them for the first time in Aug. for my nephew's wedding then for my business. I can't wait. I love the chafer that I purchased the fact they fold and come complete with everything is a great thing at an unbelievable price. I looked other places for some for my business and they were not complete you would still need to purchase the 2 in food pan. I purchased four of these chasers to use at an outdoor work function. I intended to use them for keeping food warm (hamburgers, hot dogs, baked beans, and cheesy potatoes). They kept the food warm and also looked great! Before the event started, I realized I also had food that needed to remain cold (veggie pizza with a cream cheese topping), so I put ice in the bottom pan. It worked great! The veggie pizza remained cold. After the work function, I was able to easily clean them up, fold up the base, and store them back in the original boxes. Very easy and convenient! My next purchase is going to be the half pans and third pans to use for smaller dishes or sauces. I can't wait to use them! Perfect for the small Business that doesn't do a whole lot of catering. We use this for contest in our local area and found it to be large enough to serve it's purpose. Dull finish up against my other stainless steel chafers, and I misplaced fuel holder, so the legs don't stay in place and it collapses on me. This is an all-time fave, our customers love this Chafer, as they get quality for a great Price, allowing them to acquire several at a time, solving their foodservice needs for restaurants and private events. Grealty recommended. I love this Chafer. It is simple, yet looks nice and is easy to clean and I love that it folds up and doesn't take up much room when we are not using it. I love these chafing dishes! I purchased them because I have 4 children that will be having open houses and this was a much nicer way to present the foods than the disposable pans. The price was more than reasonable for the product. My favorite feature is the hanging lid. It actually has 2 options for hanging the lid which makes it very convenient. The only issue I had was the metal is not as "tough" as it could have been. Which is why I gave it 4 stars, as opposed to 5. However, for the price you are paying it is more than decent. Overall, I would definitely recommend this product to anyone. Very elegant! I use this for catering parties and such and these a very good. These chafer's are not too difficult to assemble. You can't go wrong! These Full Size Stainless Steel Chafers are the bomb. Pretty high quality and the price just cannot be beat. I would recommend these for any party planners! What a deal! I bought these for home use, we have a large family and these chafers really elevate our meals to an elegant affair. These keep our long drawn out meals nice and warm ready for when we need seconds. I purchased the Choice Economy 8 Qt. Full Size Stainless Steel Chafer with Folding Frame and they look great. There was a minor imperfection on one of the fuel can trays (it was bent/dented in on one end). Other than that this product is what was shown in the picture as well as expected. The absolute best thing about ordering is the fact I received my items the very next day. That is an amazing shipping time considering I ordered under regular shipping. I ordered my items on Tuesday and they were at my door by Wednesday. I would like suggest, however, since the company uses Fed-Ex to ship items that you not display what's in the box on the outside of the box. My box plainly said stainless steel chafers on the box for anyone that walked pass my home to clearly see and take (Fed-Ex leaves items on the front porch). Other than the shipping issue and the small ding, I am very satisfied with my products. I would definitely recommend and purchase this item again. Choice Economy 8 Qt. Full Size Stainless Steel Chafer with Folding Frame . This is a fantastic product, especially for the price. I purchased them for my parents 50th Anniversary buffet and I am extremely satisfyed with them. They store very nicely with the floding frame. A great purchase ! Love that it folds down. All the pieces nest nicely into the original strong cardboard box it comes in to transport. Winner ! I just had these delivered today, and I am so happy with them. Considering that we are limited on storage space the fact they collapse is wonderful. I ordered 5 chafer dishes for my niece's wedding reception. They worked out great! They were perfect for keeping our food warm for our guests. I have used these on four other occasions and have been a great help to our caterers. Perfectly packaged and easy to assemble! Affordable and very useful for our wedding buffet. I would buy more in the near future! Shipped quickly and easily clean up. Please don't be deceived by the reasonable pricing on these chafers! They are sturdy, easy to set up and look great. I recently launched my chef services and was immediately contracted for an upscale brunch for 80 women. After pricing out chafers on over a dozen websites, I settled and ordered 6 folding chafers from Webstaurant Store. They arrived quickly, were not damaged and were much more professional looking than the cheap disposable chafers I've seen in various stores. I received so many compliments. These were a wonderful and reasonably investment. I've already referred 2 fellow chef colleagues to the site! Bought these for our wedding, which we are half catering ourselves. Can't believe what a good price we got for them- they seem to be great quality. These chaffing dishes are great for people getting into catering or doing large events. Well built easy to clean stackable good deal for the price would recommend to anyone who has limited budget. Very convenient ! This chafing dish is great because it folds for easy storage. Making it easier to pack away when not in use. Love these. I am very impressed and pleased with the quality and performance of this product. I like the compact nature of it as well. It makes for an elegant and professional presentation. We ordered these for some parties we were having. They worked wonderfully! They made serving food so much easier and we were able to keep the food hot for quite a while. They also look very nice. They are a great quality and you can't beat the price. Easy/Compact storage. Would order them again if I needed more. The folding frame is a great space saver because it allows multiple frames to be stacked. The weight of the stainless steel chafer is also sufficient. This item is as described. We werer very pleased with the chafers. We have used them numerous times and have had no issues with them. We would recommend this item. Product is amazing. Bought for to use for a reception. Held up great. Don't let the low price fool you, couldn't beat it. Have used on several occasions and no complaints. Would recommend this product to anyone. Ii was going to rent these chafers, but for only five dollars more, I was able to purchase them here. 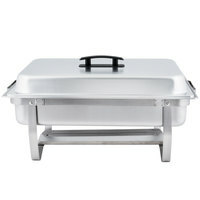 Very good price through Westaurant.com, on a very nice chafer. I am very happy with them. It's nice to be able to fold the legs, storing them in about 1/2 of the space. This item was perfect for creating the elegant look to my grandmothers 75th birthday celebrations. It is sturdy and has been used since for a graduation party again creating the catered look and feel in the venue. When I ordered this, I was skeptical of the quality because of the low price. I was pleasantly surprised when it arrived. It is very sturdy, definately an awesome value for the price. This product is awesome Once you're done using it, it can be folded for easy storage. These are always great to use for weddings, gatherings and other social events. These are relatively easy to use. There are times my employees struggle to get everything in the correct place, but once assembled they are sturdy and I am not worried about them collapsing. I Love these Folding Chafing Dishes. My Family does a Annual Unity in the Community Outreach Program and these Dishes are great because they don't take up as much space as the stack-able ones. I also love that they come complete. As the outreach program grows I have had to order more to chafers to keep the food. That is why I am so glad that the cost is so affordable because this event is not funded . Our family supplies everything to the community for free. These are fantastic. Perfect for any busy party or catering job. Nice and sturdy, but still foldable and compact for easy storage. The lid holder is a nice addition as well. Great chafer dishes. They look great on tables and will last a lifetime. will recommend to friends and family members. Everyone should have at least two of these. Best stainless steel chafer that i bought ,Quality material, GREAT price, they fold up easily for easy storage. no complaints about this item.love love it. Once folded down, two of these kits will fit in the space of one standard chafer. The handles are also removable if you want to change the look of them as well. Very happy with these Chafer sets. Only bought 1 at first to make sure i was going to like it, and i loved it! I will definitely be buying more of these. They are so much better than using the tin foil style Chafer dishes! We ordered from this site because the price on these chafing dishes seemed good. They are a certain price if you order more than 3, we ordered 10 and only received 9. So I guess I am shorted out of the discount Not happy with this! We have an event coming up and will have to run out locally to find another chafing set. Thank you for your review, Karla. We are sorry you did not receive your tenth chafer. A Customer Solutions Representative will be working with you to make sure you receive the missing item. Good, inexpensive chafers. Perfect for catering. Cheap enough to occasionally loan out without worrying. Sometimes the legs feel a little unstable, but they do the job. Since i invested in these chafers,have saved me money in renting for my functions. They are easy to set up and fold down very nicely. I love that the chafing fuel is properly secured also. LOVE LOVE LOVE this product. This is my second time ordering them. I use them for holiday gatherings, I use them for small catering jobs, and to entertain company buffet style. Quality material, GREAT price! I have no complaints about this item. This is a great product for the price. have used this product for a wedding and it really looked great. Fast shipping got when they said I would get it. I would recommend this product and I will be buying a few more. I bought these for my new catering business. they are inexpensive, look great, easy to transport and easily stored. I know there are more expensive chafers out there but i just dont know why you would pay more if you can get these. This is an excellent choice for easy setup but also storage because they fold down fairly small and we do not have tons of room to keep these around our kitchen if they didn't fold. recommended. Excellent product! I am a reseller and I buy this on a regular basis due to high demand from my customers overseas. So far I have purchased about 160 dishes and am adding more this weekend. These chafing dishes are wonderful! We bought 3 for a recent wedding we catered and we are very satisfied with how sturdy they are and how good they look, especially for the price. I'm even more impressed by how well they store. We will definitely order more of these gems as we expand our business. Bought it for daughters 1st birthday and it's great! I got compliments about it too. Very affordable, easy storage and shipping was right on time. This folding chafer is great. The entire unit folds up into a neat little 5 inch package, and stacks on itself so I will be storing 4 of them in my pantry and taking up less space than my boxes of cereal. The fuel holder goes across the entire length of the unit, allowing you to center and only use 1 canister if you wish. This is overlooked in many fancier chafers i've seen. Many have circles that only allow you to place heat on one side or the other (or both obviously) but I sometimes only want 1 fuel canister because the food is already hot. Fast shipping once again and these are priced perfectly! Will be using this for future family gatherings and parties. Storage is great since doesn't require too much space. I did purchase the Full Size Polycarbonate Roll Top Chafer Cover for this so that guests can see what food is available and I love the roll top for convenience as well. I really love these chafers. Very sturdy and easy to assemble plus Webstaurant offers the cheapest price. First time I used them was for my son's 1st birthday party and everyone thought I rented them. My guests were really impressed with the quality of these chafers. Love using these chafers for my caterings. Very sturdy and durable and they look very classy in any setting. The lid rests nicely along the edge and they fold up easily for easy storage. Finally decided to give these a try. I ordered 10 of them for an upcoming outdoor catering job that offered no electricity. I love the fact that I can keep the lid attached to the main unit. Attractive to the eye and that is important in catering. The price was unbeatable and the product looks more expensive than it actually is. I love that they fold, saving me room while I'm packing for a catering job. I think they are of really good quality and in the future, I will be purchasing more. I also purchased Choice Gel 2 hour burn time with 72 per case. Another excellent buy from Webstaurant! Great product for the price. The quality is very good and is easy to transport. Shipping speed is good as well. Thank you Webstaurant! Will shop again. These are really nice for any occasion. I plan on ordering a lot of these for use over the holidays. I have recommended them to so many people. These Stainless Steel Chafers are wonderful, they no only stand up to the pressure with the Catering business I operate, but economy wise....YOU CAN'T BEAT IT!!!! The differences between these units and the previous ones i own are that they fold for one, which makes transporting them easier and i can accommodate more items in the vehicle AND they come with a built in hook that supports the lids when the pans are opened, I simply adore this 'little' feature as it prevent customers from leaning over the food/pan, which is really an issue for me and not to mention its not hygienic. Overall I would give them a five star rating without reservations. Purchase 3 of these for a fall tea. They arrived in a timely manner and the quality is great. Will be ordering 2 more. The economy chafer dishes added elegance to the food tables. Easy to assemble and pack right back in the box. I will definitely be recommended Webstaurant. I love love love these chafers. They are the right size for catering parties. They keep the food perfect without drying out. Easy to set up and break down. I'm getting ready to order me 3 more! Great product! I have 14 of them? In any case they have been used for many a banquet and buffet! The only reason I did not give it 5 stars is because the deepest chafing dish you can safely use is a 2 1/2 inch. I tried to use two half pan 4 inches deep for gravy/sauces and because of the curve of the water pan and amount minimum water needed in it, it doesn't work well or fit properly. Same with 4 inch full size pan, forces water out the sides because water pan is basically same size. But most applications are not going to use bigger than 2 1/2 inch anyway! we have a home based business, space can be limited, so these folding frames are very convenient to use and store. Good quality and structure. Great quality for an economy chafing dish, folding design makes it a lot easier to store and transport these as opposed to traditional chafing dishes. Side clip is another great feature on these enabling you to rest the lid standing up on the side of the dish. Stainless steel is thick enough not to dent too easily. I was looking for something affordable, durable, light weight, collapsible and this was perfect! I use it frequently and love the folding frame. Perfect for weddings which is what I usually use it for. I have received several compliments and looks amazing when set up for buffet. Holds heavy meats with no problem and holds a lot of food. The full size chafer is made of good quality stainless steel and comes with everything necessary to serve hot (or cold) food. The chafer has two hooks for holding the lid on the side of the dish, but make sure the lid is properly in the hooks to prevent the lid from falling out of them. Bottom line is this is a good economy-priced chafer solution. I ordered these items for use in my catering business. Aside from the items being very reasonably priced they were also of the highest quality. Very professional. Looked beautiful on buffet for wedding. Easy cleanup and storage. Highly recommend. Price was unbeatable for such a great product. Will be purchasing more in the future. The Choice Chafer and Folding Frame set has been perfect. We don't have to hunt down the individual components, furter the frame folds down taking up less storage space when not in use. I bought 3 of these and found them to be, besides affordable, very functional. I can use them on my family gatherings, but are nice enough to use them on more formal events. I am very happy with my purchase. Great little affordable chafers! I have used them for several events. Easy to clean and you can use disposable hotel pans for easy clean-up. I will definitely order more when I need some. These chafers are great. The price is really good from webstaurant. I have bought very similar ones from costco for a very similar price. The folding frame is convenient, but i just end up stacking all of mine together, which works really well. I love this chafer! I love that it folds up and it holds hot/cold foods well! I also buy the plastic roll tops to pair with them. Great product and great price! Very easy to set up and tear down. Have used for several events - keeps food hot for hours. Have also used container to hold food on ice. Would highly recommend this product. This product is wonderful. It is definitely worth the investment. Very classy, convenient, and fast shipping. I am looking forward to hosting parties with this product. Thank you. We love this chafer.....the price is awsome, the quality is good, very attractive, durable,easy to set up and take down. When we ordered this the first time we were amazed the it was complete with lid, water bath, and heat holders. Safety locking tray underneath so it cannot fold during serving. Great product. Try it you'll like it. Just because the price is low, don't think the quality suffers. These chafing servers are actually rugged and sturdy enough to handle almost all of your catering needs. My first time using them, I got a lot of compliments on how professional they looked and the clean up quite well. You can't go wrong by ordering them. These look great! Purchased for my upcoming wedding and they are beyond what I expected for the price. They also arrived very quickly! Will order from this site again! I ordered these for my wedding. I ordered 7 of them. The price are GREAT!!!!!!!!! They make any event look for elegant and they can be used over and over again. I highly recommend this!!!!! I bought 6 of these for my son's birthday party. They're great, they fold easily and become compact for storage. Everyone thought I spent a fortune on them because they really look expensive. I would definitely purchase more since the price and quality of these chafing dishes are unbeatable. Shipping was also really fast. These chafers are very nice and sturdy for the price point. The folding frame really helps for storage of these and everything you need is included except the fuel. The Chafer made the food presentation beautiful and professional looking. The price of the chafer was affordable. The quality of the product was good and above average. This is a caterer's dream economy chafer. Durable and fold up for easy storage and transport. Quality surpassed my expectations and would highly recommend this product! Can we say best value ever!! I researched this type of product at several stores and found this was the best price and value for your money. I ordered 6 for my wedding. They worked out perfect and looked very professional. People even thought they were brought by the caterer. The best thing about them is they clean easy and store with a lower profile for future events. I bought one to see if I would like. Very nice I like I can fold legs in to put way. I would buy again. As a start up catering business, I find this product perfect. Excellent quality, price and fast shipping. There are several restaurant supply companies in my area, but their prices are slightly higher for less quality products. The Chafers are nice it's easy to pack saves a lot of space only down fall is it needs more height to burn fuel it's too close to pan. WoW!!! What a great deal! Looks very nice and elegant! I would buy again. You can't beat this price. Thank you Webrestaurant for another great product!! Well worth the money, I've used these a half a dozen times now, really held up well, I like the folding portability of these. Finish and surface look like new still. Would buy again. This is a great quality chafer for the price. Since it was economy priced, I didn't expect it to be as well built as it is. You really don't need to spend the extra $$$ to upgrade as this chafer handles all your catering needs. I love the sterno holders too. Great for storage!!! i LOVE how they fold up and don't need to take up a lot of extra room for storage. If you put a cloth between them you can stack them on top of one another. AWESOME! These Economy Chafer Sets are just what we needed! We didn't want to spend a lot of money on them because we only need these once or twice a year. I couldn't believe how nice they were for this price. They worked perfectly & looked nice too!! Excellent budget chafer. I didn't think it was possible to purchase one at such a low cost. Will definitely get this one again in the future. Very easy to use, very easy to store, very easy to clean, when I use them the table look like a pro! Love it! I highly recommend it! This chafer works perfectly for our occasional use. It folds up and is easy to store in tight spaces. They are not the fanciest, but they get the job done for us. For the money can't be beat. Used it for last years Christmas Eve party and will be using it again this year. Very nice and pretty heavy duty. Great product for the price. I have 2 so far and plan to purchase more , They are very easy to clean, durable, and look good. Great option for the price. Very easy to put entire set together. Light weight, yet fairly sturdy. I only use them about 4 times a year, so the quality was perfect for this. They were so easy to use, I am considering buying more to use at my home for larger parties and family gatherings. Absolutely loved this chafer. While it's the "economical" option, it looked great with the decor and served its purpose perfectly. I would recommend this product to anyone whether professional caterer or at home host/hostess. I ordered six of these chafers. First of all they looked great! The idea of the stand folding up was great. It saves a lot of room when not in use. I only wish I had ordered these sooner. The cost and quality of the items was so affordable. Perfect for our catering needs! Easy to store as everything folds and nests together. Lightweight to carry, but sturdy enough to hold hearty dishes. Would purchase again. I bought two of these and they worked great! It was easy to set up and easy to clean. Very sturdy and fast shipping. Extremely satisfied with this purchase. These chaffing dishes are a good low cost option that look more professional than the disposable wire frames I've used in the past. I own a bbq restaurant/catering business and we used these for nicer events such as weddings. I am very pleased with my order! It is very durable. Perfect for any future catering. It will also be great for our parties. The best part about it is it has a folding base and it doesnt take up so much space for storage. I ordered two of these to serve warm appetizers in for my wedding. They are a great product at a great price. I plan to purchase more as gifts. So happy we purchased these!! I had originally bought 5 chafers for our vow renewal, but, my best friends daughter got married this weekend and used them first!! Worked so well keeping the meat and beans warm! We also used them for salad and potato salad...we just didn't use the 2 1/2" deep insert and put the salads right in the 4" deep pan! Everything stayed covered and looked uniform! Will buy more if we need them! At first, I ordered 3 for our silver anniversary and for our other family's functions. I was extremely satisfied and happy when I see the products. I have not used them yet but I am sure it's gonna be spectacular and phenomenal. The fast delivery is unbeatable as well as the price. I purchased additional 3. I recently did a 10 year wedding anniversary party in New York. The client and their guests loved the presentation and could not stop raving about the decor and food. Upon ordering this chafer for such a low price I was skeptical about the performance. I am glad to say that I was proved wrong. Good design, and it folds up into a nice stackable rectangle! Going to order more of these!! I love my new chafer set....will definitely order more and I need chafer fuel. I can't wait to use this. Good quality and less expensive! this value stainless steel chafer is a great product. the frame folds for easy space saving storage. its built very well and looks great. we love this chafer for our buffets. Choice 8 Qt. Stainless Steel Economy Chafer with Folding Frame in action. Buffet catering 5/16/2014 California. Easy setup and take down. Frame stores flat for storage. Absolutely love the space saving size of these! We don't use ours a lot so storage and traveling with the compact box is great!! fixing to order more for a large wedding later this month! The chafer was easy to put together. Great price, quality, durability and they look perfect. I cannot wait to use this for our wedding buffet. Highly recommended this product. These chafers are great. They are very easy to set up and they take up very little space when travelling. They work good with disposable pans also. We bought four of these chafers and it was well worth are money spent! Great sale price, quality, durability and they look perfect for our wedding buffet. I love ordering from The WEBstaurantStore! I ordered 4 of them and they are awesome chafer sets! Set up, breaking it down, and cleaning it were extremely easy.Great item for the price. Highly recommended this product. .I will be ordering more for me or as a gift. For the price these things are awesome. We needed a cheap way to hold lots of food at a hot temperature. We combine these with the "Choice Wick chafing fuel - 6 hour -24 / case". We only need fuel for 1-2 hours at a time. And two of the fuel's for each Chafer have lasted three events so far and kept the food hot. We boil the water prior to putting in the bottom of the Chafer's. We also put an empty pan on top of the water to make sure the water level is not too much, but just right. Like the pictures show, these are the full size professional looking Chafer's. You will be happy with them. Very Good Price for the product . We utilize them at our Home Football games in the private boxes. The fold up feature is great for space saving . Amazing product. They were extremely easy to set up and clean. They break down fast and they are easiyl stored. I will be ordering 5 more as gifts. Love Love this shafer. This chafer is a great, economy product. Keeps food heated and looks great. Very easy to clean and maintain. You can use one or tel chafer fuel cans underneath it depending on how hot you need your food to be and how quickly. Durable and easy to set up at events. This choice 8 Qt. Stainless Steel Economy Chafer with Folding frame was easy to put together and was stackable save space. Good quality for the price. I will buy more. these worked great for our event and we plan on ordering more. i dont think you can beat the price for the quality of the product. These classy chafers were very reliable and easy to move around. The fold down base made storage and transportation very smooth and easy. I am very glad I purchased this product and would absolutely suggest it for those that cater and even those that just love entertaining guests at home.. Awesome Chafer sets and the folding frame works great! Shipping was quick and everything was packaged perfectly my clients really loved this order and will be ordering again! Great product for the price. Sturdy and easy to store. No need to pay forty or fifty dollars for a Chaffer Highly recommended this product. . I ordered 2 chafers....I love love them . Needless to say, im about to order another 2 along with another item . extremely fast shipping. .very happy. We rent these out a lot and they are holding up well. I like that they are lightweight , easy to store, clean and transport well. This chafer is high quality. I was skeptical at first, but after buying one, I bought several more. They are easy to assemble and fold up for easy transporting. You cannot go wrong purchasing this item. As with any chafing pan these are wonderful for heating food on a buffet. They have a very nice appearance and the folding stands make storage easy. I use them for both indoor and outdoor. great price there almost twice as much anywhere else i got 6 of them and will be ordering more soon. very strong and the abilty to fold them is great takes up alot less room the the non folding ones. easy to set up and take down. We run a foodline at our Greek Festival. These chafers fit the bill for our needs. They keep the food at optimum temperature, no scorching. Very easy to clean and store. I love my stainless steel chafer. It is perfect for my start up catering company and the fold up legs make it a great option if you're using your own vehicle for transportation. This chafing dish is wonderful! I bought this because I have a relatively small car and needed to something to save space as well as being able to quickly transport from the kitchen to the farmer’s market every week. I really love the fact that the frame is foldable and can nicely stack on top of the pan. The only thing that I would mention is a small minus for this product is the fuel holders. The Choice Wick Chafing Dish Fuel doesn’t quite fit in the holders, but I usually put them to the side and chose not use them. Overall, it’s a very sturdy product and it holds 1 full size 2 1/2” hotel pan or 2 half size 2 1/2” hotel pan perfectly. Wow amazing Chafer for the money. I bought 8 chaffers for my business and they hold up very well to heavy useage. I approve of this product. I absolutely love this chafer dish!! I ordered one for my wedding and it is perfect. I was unsure at first but once it arrived, I was sold!! Im actually about to order 2 more! Great Dish, Great Price! Very nice chafing dish, particularly for the price. Excellent value for a well-made product - very sturdy and not 'cheap' in look or feel. I purchased two of these for a luncheon and will definitely buy more. Bonus that they fold for compact storage. I was really skeptical about buying this because it was much cheaper than the other chafers, but it is very sturdy and really nice looking for any occasion. I bought this for my wedding and its gonna go with the theme just perfect. This chafing dish works great for family functions, buffets, catering and such. Easy to set up and easy to wash. This chafer is pretty versitile and is recommended. This is surely the BEST investment purchased for catering. My kids are always having their friends over and having my chafers are a lifesaver in perserving their refreshments. In addition to family gatherings are HIT as well, now people think we are rich and were looking for the white gloves servers to appear next. thanks Webrestaurant, you rock. I have limited storage space and when I needed to purchase new chafers i wanted something that I could store easier. these store flat and we keep them in the boxes sonone of the pieces get lost. and they were a fabulous price. Awesome chafer for an even more awesome price. I used these for a big birthday party I threw for my wife and everybody thought it was catered by a fancy catering company. They look great and I would buy them again if I need to. So glad I made this purchase. I got an email that these were on sale and I had been looking for some. Exactly what I expected based on the description!! Arrived fast and ready for use. Great, inexpensive option for buffet service. Legs fold in for easy storage. Plastic handle is a little cheap-looking, but we tie a cloth napkin to it for a finished look. I purchased 3 chafing dishes for my 40 BLING IT ON event. I received notification that my order was shipped and received the package within a few days! I could not believe how fast it arrived. Thanks for providing excellent service! Makes caterings look very professional at a really great price. I use these often and they've held up great through various events and look nice too. I was very impressed with this item. the price makes them very affordable. this is a durable product. they made my buffet table look professional, they keep the food throughout the event. fell in love with it at first sight, it did justice than what l saw on the web, most especially the folding frame that can be fold and store away, am definitely ordering more of this . This chafer is a good value for the very reasonable price. They fold easily which is great for storage. I use them as back ups and leave a couple of them in the van at all times. The lid and pans are interchangeable with my other chafers as well. I purchase 2 of these to tryout, and I fell in love with them. I then order 2 more for a gathering, and they turn out to be the best. I am now in the process of replacing my entire line of chsfing dishes. Love them! Exactly what I wanted Pro: fast shipping and the size are exact Con: none really, they are nice dishes and we work well for my future parties. I bought the stainless steel economy chafter with folding frame, and am in love with it. easy to mantain and afordable price. same as described and same as seen online. i feel like buying 1000 pieces again and again. life savers! great shape and easy to install. delivery time was great. i will order more in the near future. satisfied and happy customer ! Very good quality...used for my sisters wedding and will be using for my catering service. I would recommend the use of this product to anyone. I literally just ordered 3 of these yesterday morning. I went to track it and it arrived at my house an hour ago!! Fast service is the way to go.. I cant wait to use them for my next catering job!! These chafers are economy quality but work fantastically for most of my catering events. I bought 3 of them. I LOVE that the frames are folding which makes them easier to store. Highly recommend! It works well overall, but there are a couple minor flaws. The lid does not fit securely into the holder on the side, so it may fall if you try to leave it there. Also, the grooves on the bottom are not sturdy, so it can be difficult to get the fuel tray in place. I am so pleased with these chafers. one of them got damaged in shipping and customer service sent me a new one. thank you ! The stainless steel chafer keep hot threw the event and was very handy. The guest loved the fact the food wasn't cold and kept hot. Excellent equipment, high quality product, strong construction, perfect for all activities, best price on a chafer, and the quick shipping is the best. I recomended this product. I purchased 5 of these chafing dishes. They arrived pretty quickly and no damage at all. These are excellent, especially for the price I paid for, it was a bargain! I would recommend this company to my friends and family. Thank you! My holiday buffet table will look so much more nicer this year and the years to come. We used these for our Surprise Wedding/Housewarming Party. I cooked everything and these really helped me to not stress about everything being cooked at once! They held temperature well and looked nice! I was going to rent some and then saw I could BUY some for less than the rental price! This is definitely going to be our go to place for entertaining pieces! It's a great quality for the price plus it's a space saver when you store it. Showed it to my friends and asked me to buy for them since they don't do online shopping. Will buy more! Delivered in 2 days! I can't believe how past is the shipping!!! Beautiful and elegant design stainless steel foldable chafer. Great look and can be store easily. Great for entertaining at home or for a business. The price is right compare to others. These things are great! They fold which saves on space and comes with all the pieces you need. Great value, I am sure I will be back for more! This is a fantasist chafer for the price, I was able to buy the chafer and the candel lame frame spending less the 50 dollars a chafer. I wanted to change the handles but was in able to fine the right size at the hardware store. In the long run buy the pans will coast as much as buying this chafer and upgrading the stand. Elegant design, Great look and Inexpensive. Not only looks great in your parties also serves the purpose. Guests can get hot food on their plates whenever they want. After everything was said and done, I forgot to place the lid on the handles for it to sit up on these. This holds a lot of chicken. I was so happy with all of the items that I purchase from this website to make a nice wedding reception for one of my niece. Will post other photos. For the price, you can never go wrong with these chafers. They look good and it can keep your food warm and presentation is great with this item! I love the item also very good price good reliable company to order from everything arrived on a timely manner thank you much see you soon. We bought three of these chafers this spring and have used them numerous times since. They fold flat - making them very easy to store. Despite the low price they look fabulous on any buffet. I tend to use disposable half trays in mine so I can serve double the number of items and clean up is a breeze! I was honestly expecting these to be kind of lightweight and flimsy feeling. I was wrong. I got four sturdy chafing dishes instead. They look great, and I have a feeling they'll hold up really well for future family events. I previoulsy purchased three chafers from a local wholesale box store here in Florida. When I received notice of the sale price of these chafers here at Web Restuarant I couldn't believe it. So immediately I returned them and for the price I purchased those three I was able to to order 7 from Web Restuarant. The shipping time was unbeliveably fast and not to mention the response time from Customer service was just as quick. I am more than pleased with the quality of this product. Thank you Web Restaurant this was the best shopping experience I have ever had. wow order these for my mom's 35th anniversary, received them in 3 days . This chafing dish has real good quality and made the food table look very elegant. will be purchasing 5 more for future events. These a great for quick setup & break downs. They hold up very well and are so easy to transport, I always have room for them since htey fold up flat. It's the same good quality as a more expensive one that I purchased previously and it folds so it takes up less room in storage. Amazing product for the price. Lightweight, easy to set-up and store. A+++ Chafing dish. We will for sure be ordering more of these for our future events. Have had 4 of these for almost a year. Super easy to set up and so far, they are holding up just fine. Would reccomend them to anyone needing inexpensive chafers. Bought 1, like it so much went back and bought 4 more! Only thing, and it's not a big deal really, is the Chafer Wick Fuel cans don't fit all the way in the holders--you can't close the lid and extinguish the flame--so the maybe there is a shorter can of wick fuel recommended for this product. These are great chafers, especially useful for hotel buffets, or even large parties thrown at your home. Light weight, easy to clean, and well balanced. Very handy chafer, good for buffets, parties and more. It's large enough to hold a lot of food -- or get a divided pan and put two or more different things in there. When you're done, it folds up to reduce its size. I got three of these folding chafers for my buffet. They are easy to transport,and hold the food nice and hot for the entire function.The best is storing them,and the price. We are very impressed with the quality and sturdyness of this chafer set. Folding legs make it the optimal choice for storage and protecting while stored. Nothing shabby here! I used the Chafer and Folding frame with the clear Roll top. The transport was great and everything attached perfectly. I was able to mix and match items to tailor my different events. I love, love, love these chafers!!! They are the very BEST and are of EXCELLENT quality for this price...I would indeed recommend these to everyone and have plans to purchase more!!! Quality great for the price, I now own 20 for my catering business..love that I can put back in original boxes for rentals..great product for any use. Bought these b/c I needed water pans & lids & could not buy them individually for less than what these were on sale for. Not to mention I got 2 inch food pans & stackable chaefing racks too! Water pan sits low therefore it causes the sterno flame to go out. It was a disappointment after being excited about the folding frame. The sternos have to be placed on the outer perimeter of the water pan and not under it where it should be! Thank you for your review of this chafer! We are actually going to be requesting changes to the product design so that in the future this will not be an issue. However, you may find better success using gel fuel with your chafer as opposed to wick fuel! Gel fuel, such as item 174CGFE2, provides high-quality heat and burns cleanly without leaving residue behind. Please let us know if you have any questions about our products! Bought this for a catering event and this is very easy to clean, long lasting, easy to maintain, and will not break on you. Definitely the best purchase from the website. OMG,I stumbled upon this site, and it was the best stumble yet.This product is AMAZING, I bought three, and ordering three more.Store away easy.I have lots of gathering, my serving table looks AWSOME. FIVE STARS IN MY BOOK. These are a great economy option for chafing dishes. Be sure to get non wick fuel because the bottoms of the dishes are very close to the frame holding the fuel. Very sturdy and did the job. bought for personal use and entertaining. Excellent product for the money, used for new years eve party and with the fuel cans kept the food hot all night. Very large would hold a lot of food. I bought 2 economy chafers for my daughter for Christmas. The product is of excellent quality, and keeps food hot, also very economic for its great quality in stainless steel, completion, and on the whole very good. I love your price. It's been the lowest I have seen. I own similar chafers like yours and it last long. Thank you so much.